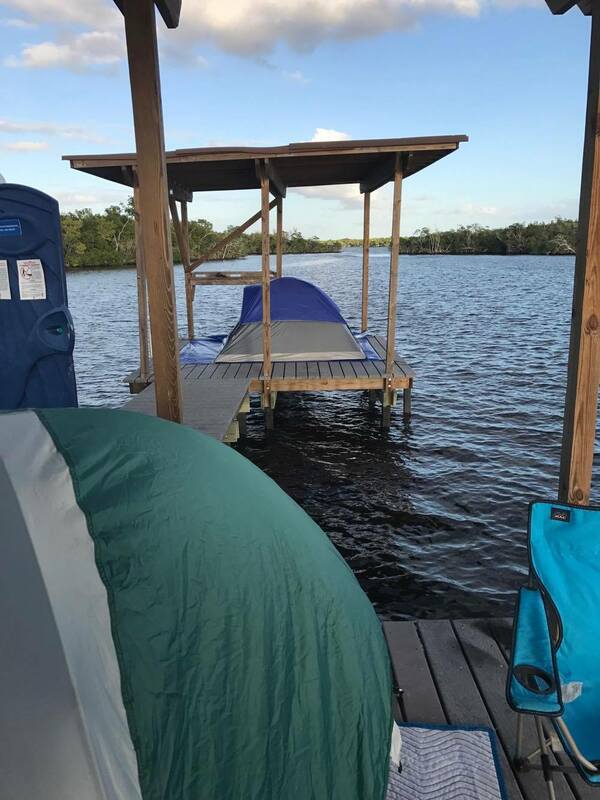 An Everglades camping trip of a lifetime. Our adventure started with a spontaneous camping trip. Capt. Peter Lopez and I, Capt. 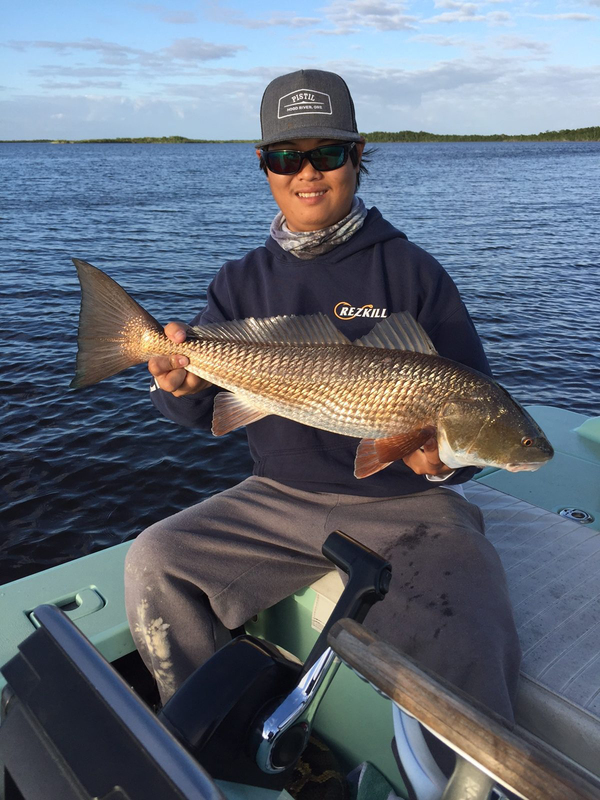 Bryan Limsang headed down to Everglades national park. Everything was going well, the weather was decent, besides the overcast skies and 15-20 knot winds. 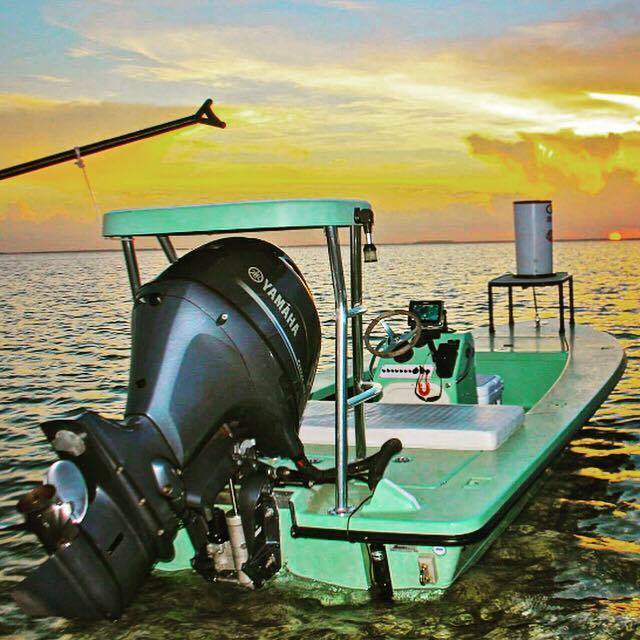 We set out with the idea of venturing deep into the Everglades. A good 60-70 miles away from any form of civilization. We fished our way up to the place we would call “home” for the night, it already being quite late. We made quick work of setting up our camp with the idea of going fishing and catching dinner. After about 20 minutes, a gentleman by the name of Jim Winstel arrived with his daughter. They were the other campers that would be staying on the other side of the chickee. After talking with Jim for a little while, we decided to go fish a few shorelines before the sun set. We didn’t have much time so we decided to stay close by. After about 10 minutes of not hooking into much besides a gar and a mangrove root we knew we would be eating canned goods for dinner. We enjoyed a feeling of not a worry in the world. Well, besides when the mosquitoes came out to play, but we just kept fishing. While skipping soft plastics into the thick brush I saw movement in the corner of my eye. Once I realized what it was I was in complete shock. I spun the skiff around thinking I was seeing things and that there was no way I was staring at a GIANT Burmese python. The python had a plan, he was following the skiff trying to get aboard! We quickly made up a weapon similar to a spear using our push-pole and a knife and it was game on. I hopped down and fired up the motor while Capt. Peter hit it repeatedly in the head slashing and stabbing him in the head. This went on and on and on…. after an hour and a half of fighting this thing we had gotten our bounty. We quickly tied a rope around its head with a uni knot and motored our way back to the chickee with our prize in tow. At first we were concerned, not knowing how the other camper and his daughter would react when we made it back. He was in complete shock when he saw it. We all were in shock. We had just killed the biggest and baddest, horrifically invasive animal in the Everglades. 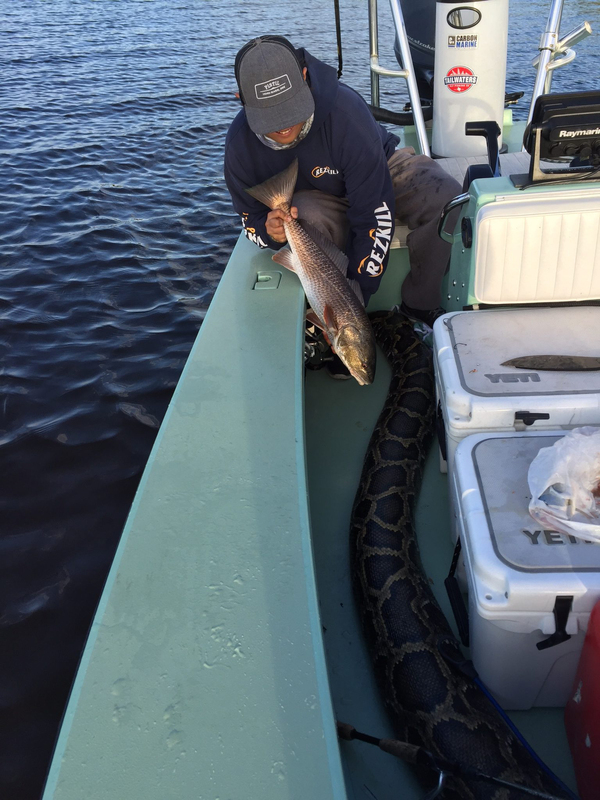 A 17 foot Burmese python, on a 17 foot skiff while only wielding a push pole and a knife. Jim proceeded to call us heros since it was only a couple hundred yards from where we lay our heads. It was nice to know we did something to help preserve this beautiful environment from such a brutal animal. 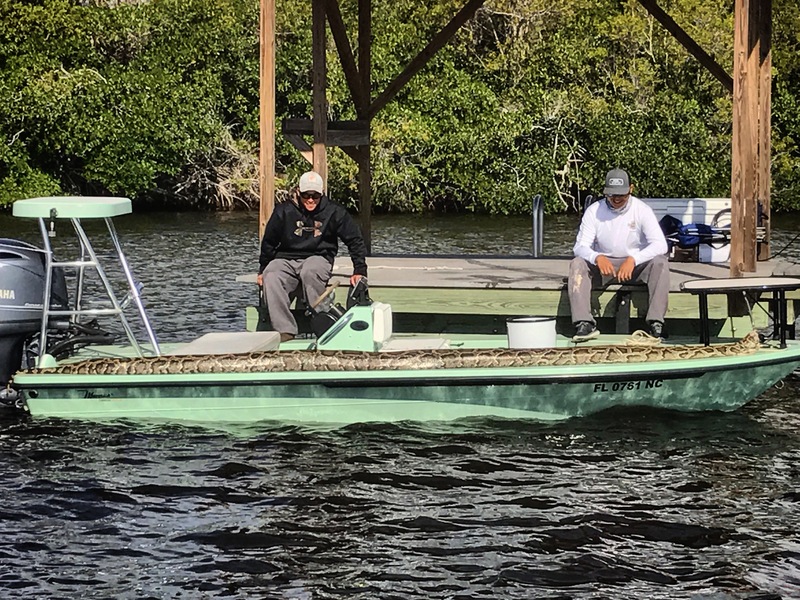 Editor’s Note: These snakes are not native to the Everglades and cause tremendous damage to the environment by eating everything in their path. Standing there staring at this massive snake with no head, still moving 2 hours after we killed it, we didn’t know what to do with it. Pete and I came up with a game plan to tie it up in a tree for the night so it wouldn’t attract other predators to camp. The next morning felt so surreal waking up and seeing what we had done the evening before, she was still right where we left her. We headed out to fish the morning, with no luck we decided to start heading back and fish along the way. It was honestly kinda awkward having to step around camping gear, fuel tanks, and of course this snake that wrapped around the console like it was nothing. 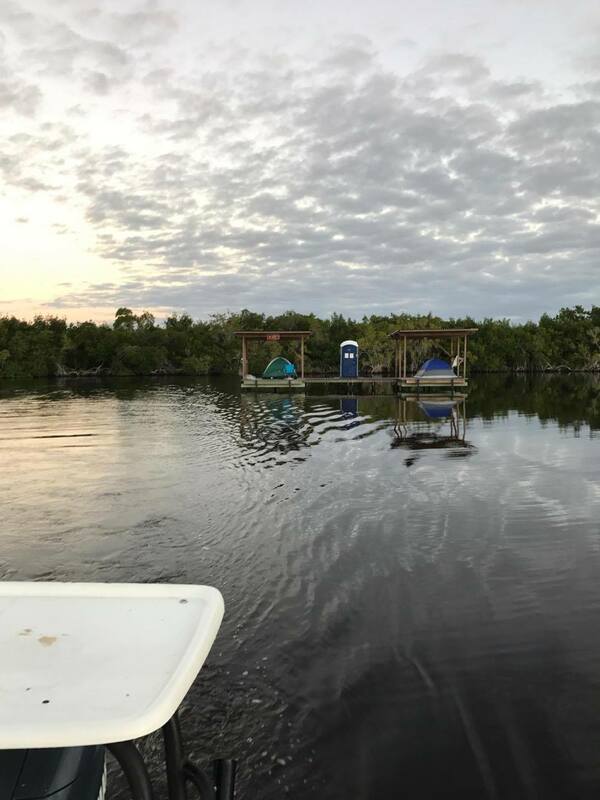 But after catching a few big redfish and losing some big snook our trip had come to an end and we were leaving a magical place and that we had successfully accomplished something that no one had ever done before. We made history. Are they actually dangerous to humans? My understanding is that they are not. Seems a lot of bloodshed with not a lot of good done. I could be wrong though. What other species are they in direct competition for food over? Burmese pythons have been found to feed on a wide variety of mammals and birds in the Everglades — even the occasional alligator! 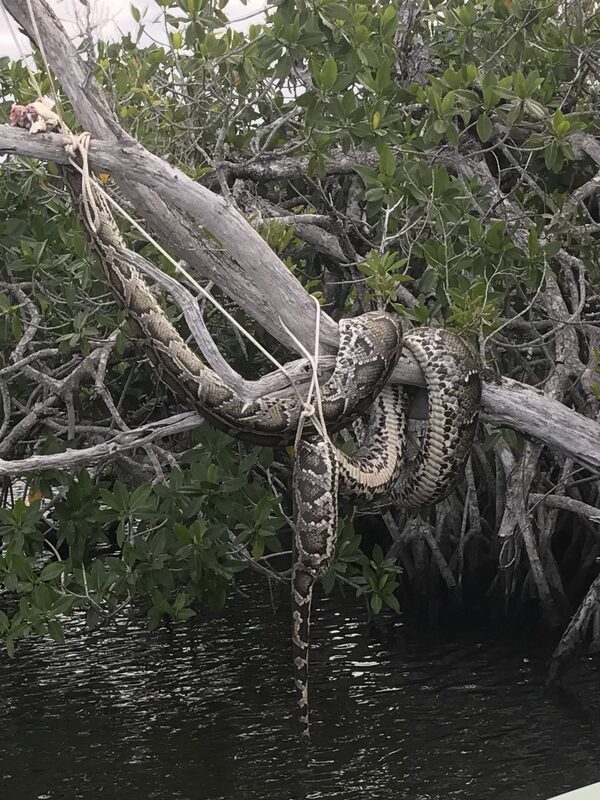 By preying on native wildlife and competing with other native predators, pythons are seriously impacting the natural order of south Florida’s ecological communities. I stand corrected. It seems they have been devastating to the region’s ecosystem.